Over the lifespan of the White Rock Sun we have used the electronic pages to promote thought and discussion within the Semiahmoo Peninsula. Two things happened that spawned this idea. 1. 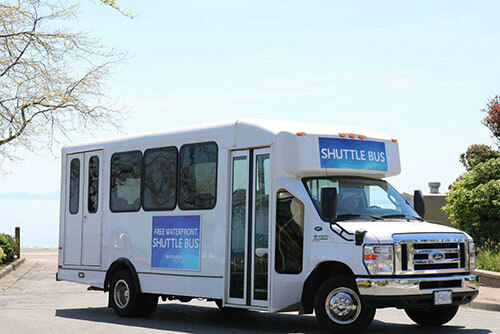 The city of White Rock spent over $30,000 to hire a company to provide a FREE shuttle from east to west beach. If you live in the area you know how that worked., People stayed away in droves. Hour after hour, day after day, week after week the empty shuttle bus drove back and forth burning fuel and adding to the toxic fog for the diners in the restaurants on the beach. 2. 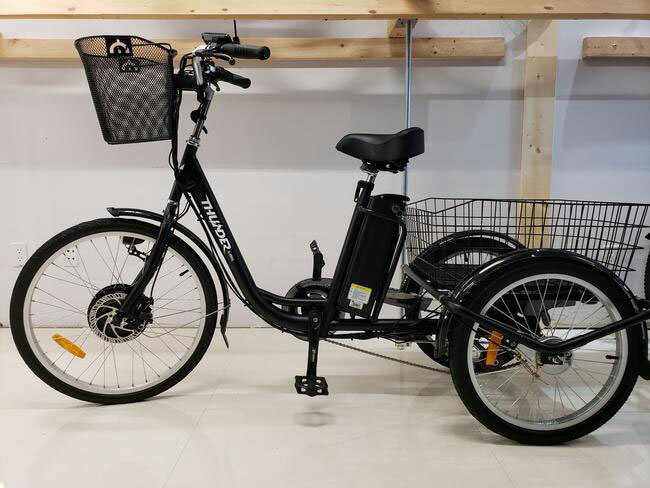 A friend purchased electric assist bicycles for himself and his lady. The bikes were purchased in Richmond made by a local company. The bikes cost around $1200.00 each. Pictured above is the three wheel tricycle version of the E BIKE. Very stable land room to carry your b each necessities. If we purchased 20 of them to start ( am confident the Richmond company would give us a good deal) but let's just figure $1,000.00 per bike. We could set up a rental place on East Beach (Semiahmoo First Nations empty restaurant across from the Ocean Promenade would be a contender. Then get the Explain White Rock volounteers to man the rental station. NO one takes a bike without leaving a credit card and ID. The possibilities are endless. We could put a little advertisement on the back of the basket on the bike promoting events and or businesses for another source of revenue. It's just an idea. A jumping off place. But where there is a will and with the right combination of council members and staff, the sky is the limit. And I don't mean a sky full of cranes! It’s one of the most magical free things to do in Metro Vancouver this winter: a breathtaking stroll around a beautiful lake that is illuminated with hundreds of thousands of twinkling lights. Indeed, Coquitlam’s outdoor winter display, called Lights at Lafarge, is a festive wonderland in Town Centre Park. Now, a lakeside table near the popular display is taking Instagram by storm. 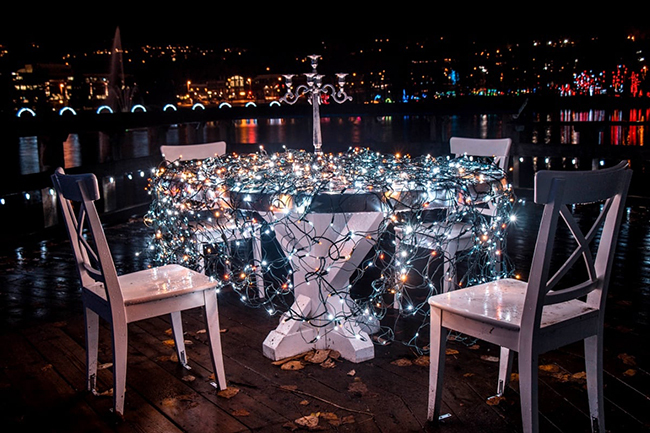 The gorgeous table looks like it was pulled straight out of a frosted fairytale, as it sparkles alongside the moonlit lake. What’s more, there’s even an enchanted looking chandelier hanging overhead. 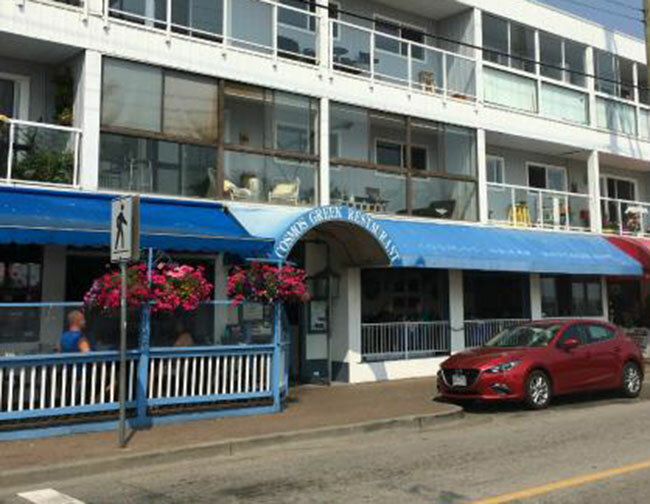 Could White Rock be inspired by our neighbours in Coquitlam? 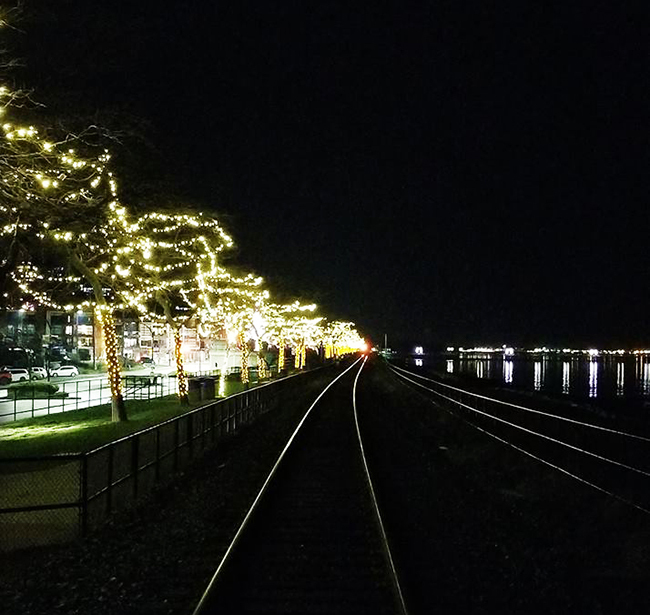 If you have been down to West Beach in White Rock you will notice there are extra Christmas lights this year. It wouldn't take too much for White Rock to create a Christmas display similar to Coquitlam's. Our waterfront could use it. The cold dark days of winter have severely impacted the restaurants which for the most part on barely hanging on. The city of Coquitlam has created a showcase of Christmas lights. Enjoy the magic of the Lower Mainland's largest free outdoor lights display at Lafarge Lake in Town Centre Park. Enhance your Winter Lights Display experience by taking in the free activities. Join the Park Spark team for pop-up activities including light making workshops, scavenger hunts and special themed nights. Visit coquitlam.ca/parkspark for more information. Free parking is available in Town Centre Park off Trevor Wingrove Way. The lights display is also just steps from Lafarge Lake-Douglas SkyTrain Station. White Rock was home to the Sandcastle Competition. At the height of its popularity over 400,000 visitors flocked to the sandy tidal pools to observe the wide array of sandcastles and sand sculptures. 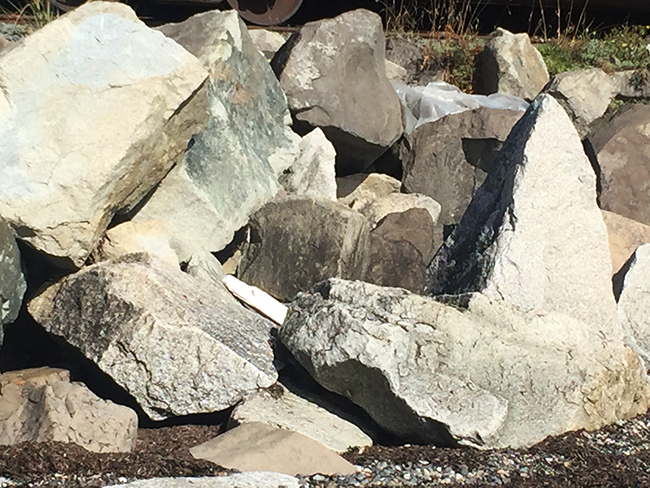 Our waterfront shoreline is home to a large number of boulders called rip rap that shore up the rail line. Why don't we create an international stone carving competition with a substantial prize money pot, this way it will attract world class artists. There would also be an entry fee to eliminate the less experienced carvers. Once completed we could leave the boulders on the beach or we could use a train crane and lift them out and place them throughout the city? 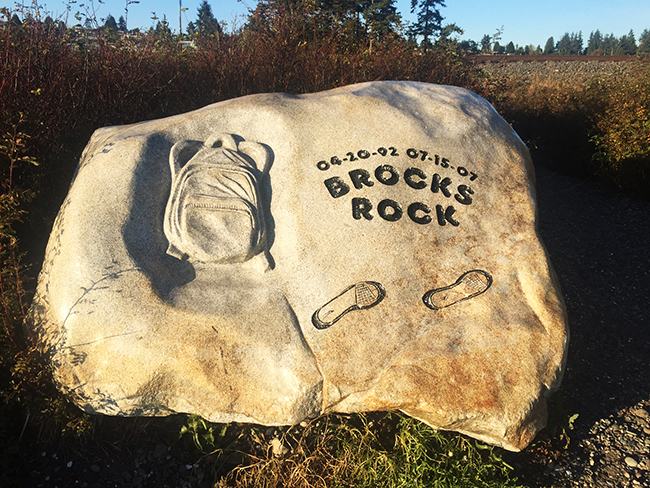 At the far end of West Beach near the eastern end of Semiahmoo Park there is a commemorative stone carving that has been there for years. 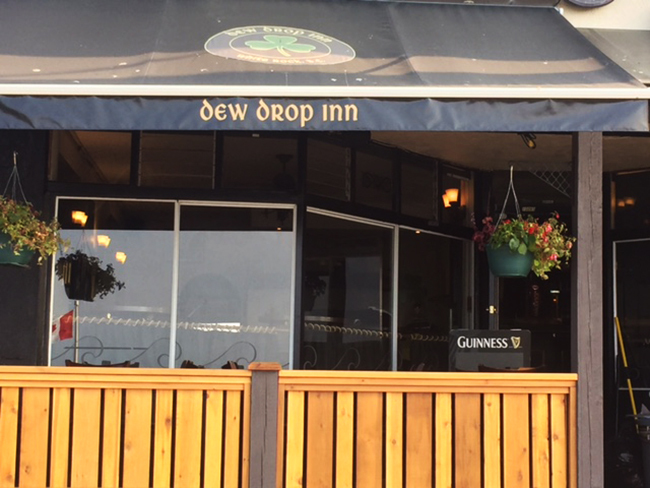 Kudos to the new owners of the DEW DROP INN now open in the old location of JIMMY FLYNN'S. 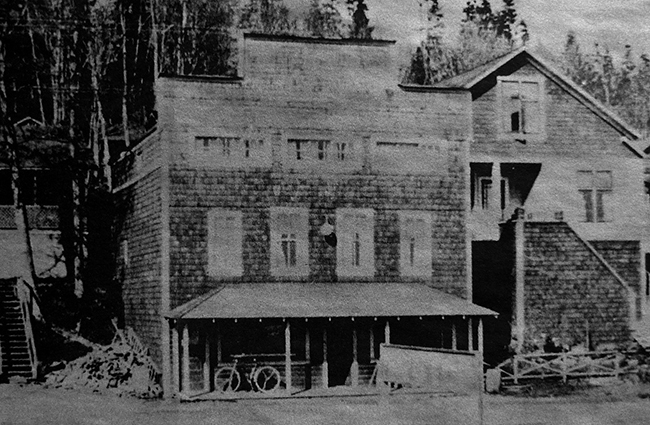 When it came time to decide on a name for the new Brit Pub restaurant the owners walked down the street to the White Rock Museum and poured over some old images. 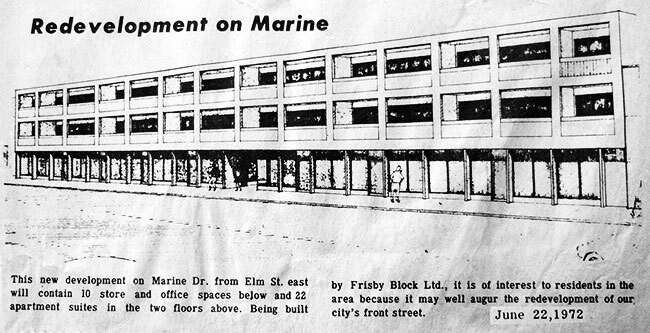 Marine Drive in those days was known as Washington Avenue. 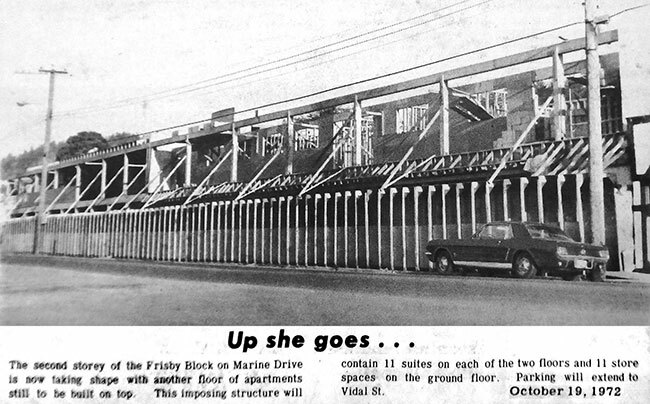 With the recent fire in the apartments above COSMOS RESTAURANT on White Rock's Marine Drive, we thought it might be interesting to look back at the history of that section of our "city by the sea." 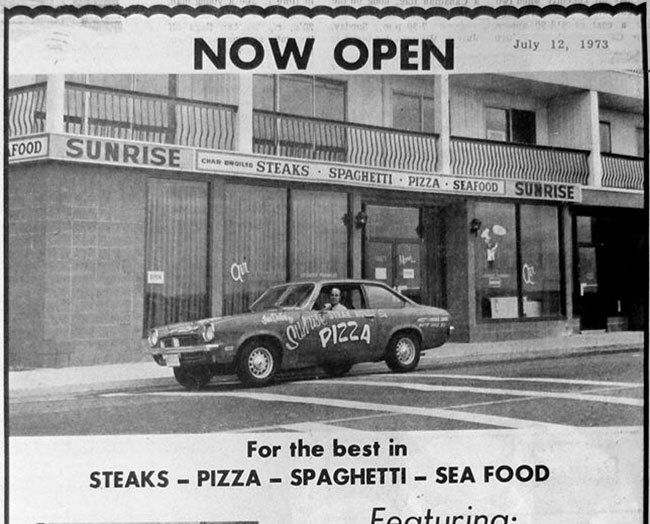 Prior to COSMOS taking possession of the commercial space in the Frisby Block, the location was home to a restaurant called SUNRISE. COSMOS restaurant suffered water damage due to the recent fire in the condo above the restaurant. Plans are underway to repair the western end of the block. It is hoped the work will be completed sometime this summer. EDITOR'S NOTE - Thank you to local amateur historian TOM SAUNDERS for pictures and time-line. This is a very cool idea Travel Newfoundland has come up with. 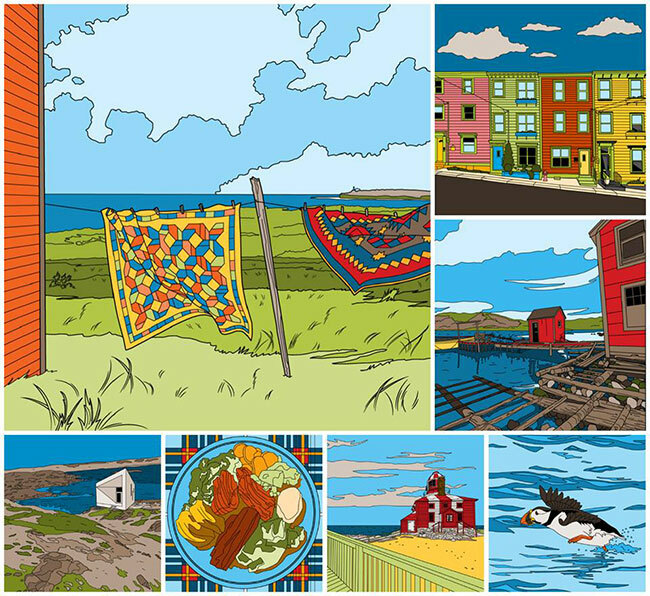 Click on the link below and you are able to colourize iconic Newfoundland images. 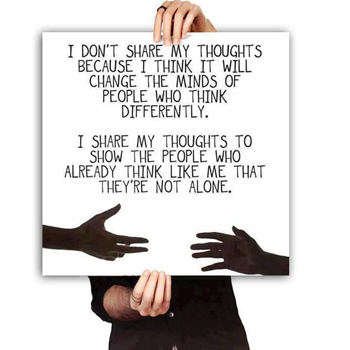 You are then invited to share them with your friends. Wouldn't this be a wonderful way to promote tourism in White Rock/South Surrey? Sometimes something once you see it becomes so obvious. 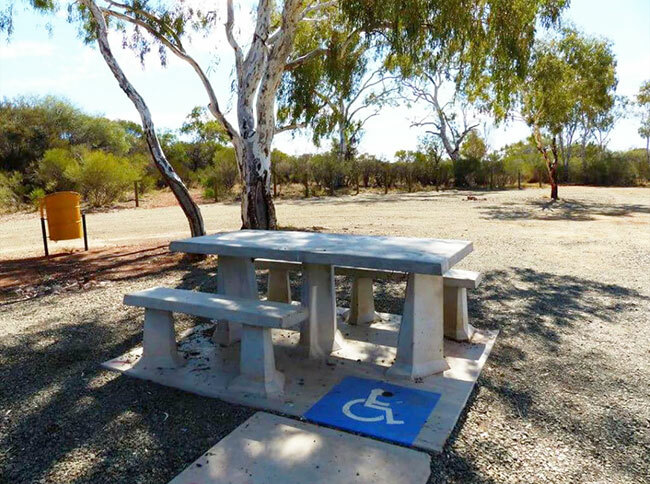 We love this wheelchair accessible picnic bench. This is a wonderful idea that started out in an elementary school. It is called THE BUDDY BENCH. If a child did not have someone to play with they simply went over and sat on The Buddy Bench. Soon other children in the playground would invite them to join in. In addition to having these in the playgrounds of the local elementary schools, wouldn't it be nice if we had one uptown White Rock where someone could sit if they just felt like having someone to talk to? The city of white Rock is facing a challenge on how to solve the problem of East Beach erosion that has been caused by worldwide rising tides, and the occurrence of a phenomenon called King Tides which are exceptionally high tides. We have had two in the last two months. The pounding of the rising tides have caused massive destruction along the East Beach waterfront. For years the business owners and residents of East Beach have claimed they have been treated like second class citizens. They feel the majority of the community events, improvements to the beach and promotion of White Rock is centered on West Beach around the pier and our famous "white rock." We got to thinking. Maybe we could solve two problems with one Good Idea. Can't you just imagine how wonderful it would be to have a swimming pool like Kits Pool (pictured above) on our waterfront. Yes there will be environmental concerns, fisheries and oceans and other levels of the Federal government will have to be engaged. The construction of the pool would create a barrier to protect our shoreline in the future. The idea would be a revenue generator. Think about how many times you have gone down to the beach, and not been able to swim because the tide is so far out. Also it would provide a perfect location for the White Rock firefighters to locate their "
I think it at least merits some discussion. 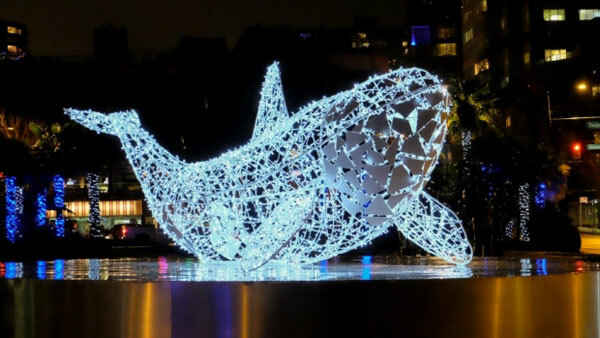 Vancouver unveiled the first of a series of stunning light sculptures over the weekend. This weekend White Rock's Christmas Sail Past will occur off the end of the White Rock pier. what a tourThanks Don will check into it todayist attraction in the winter it would be if our "city by the sea" created art installations along the waterfront like this. Heck the city could just put a call out for everyone to bring down a string or two of Christmas lights and voila! White Rock in the next few years will be forced to do something about the continuous erosion happening on East Beach. With the change of weather our waterfront will be hammered by King Waves (a result of exceptionally high tides). City hall continues to maintain our #1 industry is tourism, this might be a way to save the beach and promote tourism. 1. WATER- 4 litres of water per person, per day (2 litres for drinking, 2 litres for hygiene and cooking). Tablets as back up. Remember your pets! 2. FOOD - Set aside food that won’t spoil, such as canned food, energy bars and dried fruits. Replace once a year prior to expiry. Remember a can opener! 3. FLASHLIGHT and Radio - Wind-up radios and flashlights are essential. 4. First Aid Kit - Make your own or buy one. Keep it with your other emergency supplies. 5. SPECIAL Items - include prescription medications, infant formula, pet food and equipment for people with disabilities. 6. Other ESSENTIAL Items - Cash in smaller bills, candles, matches. 7. Assemble Your Supplies and Your Family’s Emergency Plan - Prepare a plan including out-of-area contact information and a family re-unification plan. Store supplies in a suitable container. In many cases, it’s better to create your own emergency kit. Secondly, putting together your own kit means you can custom tailor it to what’s important to you, your family and your community. Lastly, assembling your supplies yourself could save you money. You’ll be able to include many household materials you already have, and you can get a better deal on the items you do need to buy by cutting out the middleman. A new take on a favorite childhood pastime is allowing even complete strangers to make beautiful music together in downtown Montreal. Each spring, 21 multicolored swings are placed in the city's entertainment district, Quartier des Spectacles. Each seat acts as a musical instrument. As people swing, prerecorded sounds from pianos and other instruments fill the air. The more neighboring swings work together, the more melodies and harmonies begin to form. Watch this video and experience a new type of "swing music." Could you please have one for the waterfront? This picture really does not clearly illustrate the poor state the totem pole in the yard of White Rock elementary has deteriorated to. The interesting part of this good idea is when the new school was built in the late 90's Surrey School District actually went to the trouble and expense of erecting a new stand for the totem pole on the other side of the school at the main entrance. Would it not be be a good idea to have an expert on totem poles, ROBERT DAVIDSON springs to mind, perhaps he could inspect the pole and ascertain if the pole can be saved. The weathered pole if it can be saved could become a school project to sand it down, and then we could contact the original carver who apparently lives on Vancouver Island and we could have him paint, or oversee the repainting of this beautiful piece of public art. The pole was raised in April 1998 by Port Hardy resident and First Nations carver JOHN WALKUS GREEN. GREEN also carved totems for Ray Shepherd (1650 - 136 Street) and Dogwood (10752-157 Street) elementary schools. At no cost to the city of White Rock we continue on our journey of supplying the city with "good ideas." We like to think of it as a public service. Wouldn't a gazebo look beautiful while serving a very practical purpose on the green space in front of Laura's Coffee Corner in the 5 Corners District of White Rock? Local artists could display their work as well as it would provide a nice location for local musicians to busk and a gathering place for our community. We could also work in a piece of history into the design. Pictured below are HUGH ELLENWOOD from White Rock Archives and MLA GORDON HOGG recently pictured with the cupola that adorned the roof of Semiahmoo Senior Secondary. This is a recent picture so we do know the cupola is still around. In architecture, a cupola is a small, most often dome-like, structure on top of a building. Often used to provide a lookout or to admit light and air, it usually crowns a larger roof or dome. This story in the PROVINCE newspaper caught our eye. In the past we pondered why the city of White Rock had not considered turning one of our many hillside streets into a giant water slide? It could be set up and taken down after a couple of hours, so as not to inconvenience the neighbourhood too much. White Rock Sea Festival organizers, are you listening? We start off the New Year with another good idea that we would like to see somewhere on the Semiahmoo Peninsula. Here is the current public washroom located at the White Rock pier. Now just imagine if we replaced the smelly old cement cinder block bunker with this. Yes, a glass public washroom. What with the new public art installation of the "Railway Man" in front of the museum, this would be a real conversation piece on our waterfront. Come on City Hall let's have some fun. Time for some good news. Here is what it looks like from the inside looking out. +Congratulations to Joanne the only reader that identified the teaser we posted in yesterday's paper. 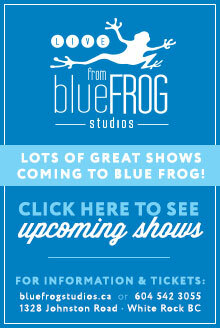 There are close to 40 events scheduled, or in the process of being approved for 2014! Most take place in North America and Europe with a total of one hundred thousand members participating each year. The largest and most internationally recognized Dîner en Blanc, is the original event in Paris. Instigated over 25 years ago by François Pasquier and his close friends, it attracts today almost 15,000 people yearly. The second largest event is based in Montreal, Canada with 5,200 guests. The Vancouver event which was held August 21 drew a record crowd of 3,000 with 5,000 names on a waiting list. Let's give those thousands a Bite Of The Rock. As you have seen and read above, the city of White Rock has been ordered by Transport Canada to close up the fence along the promenade on East Beach as well as the area in front of Bayview Park at the west end of West Beach. Instead of filling in all the railing with mesh as it appears they are planning on doing via the request for proposal posted on the city's website, could the city not do something like Surrey has done (above) at the lookout in Kwomais Park in South Surrey? The Tall Ships have made their annual trip into Blaine harbour for the weekend. 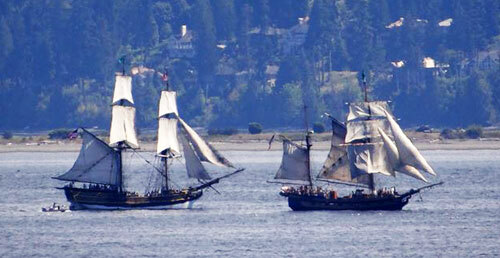 The popular explorer vessels (one actually used in Pirates of the Caribbean) offer dinner cruises and simulated battles nightly out on the far side of Drayton Harbour. What with White Rock's sea festival always having a pirate theme one would think it would be a natural to have the boats come in close to the White Rock side of the bay. As a regular user of transit I would love to be able to while away the time spent waiting for my bus, with a little swing ride. The city of Montreal thinks selectively placed swings at local bus stops was a good idea, and the response was instant and overwhelming. If White Rock instituted this "good idea" the fee publicity would be in the hundreds of thousands of dollars. Plus don't think for a moment the swings would not become popular. There are some people in our community who would not want to see the world famous sandcastle competition return to the tidal flats of Semiahmoo Bay. Environmental groups express concern the eel grass will be negatively impacted by such an activity. Jamie Harkins’ art must be seen from a certain perspective for the illusions to work, but when they are the images are mind-bending. Harkins employes a technique called anamorphosis, which results in viewers thinking his 2-dimensional illustrations are actually 3-dimensional. 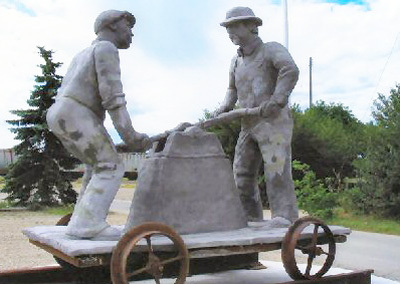 The city of White Rock has plans for a brass statue outside of the White Rock museum on the waterfront. Our good idea would be to have a railway theme as the museum began its life as the train station in "our city by the sea." Perhaps something like this railway handcart with just a railway conductor operating one side so visitors to the beach could climb up and pose pretending they are operating the other half of the hand cart. Brass statues in Little Mountain Park in Vancouver that are designed to insert yourself in the photo have proved very popular. What Would You Do To The White Rock Waterfront? North Vancouver is considering revitalizing its waterfront. 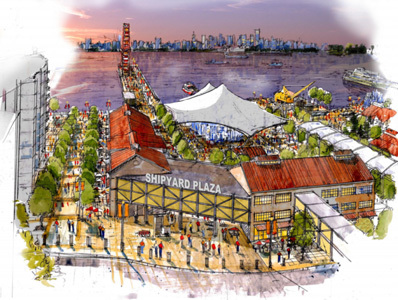 Will North Vancouver’s Lonsdale Waterfront become “Canada’s best gathering place?” Plans have been unveiled to transform the former shipyard lands east of Lonsdale Quay into a major regional destination and lively hot spot that will activate and bring business to North Vancouver’s downtown area. If funding is secured, elements of the project could be open as early as 2016. A full draft of the plan will be completed in mid-March. On the drawing board is an outdoor skating rink, a giant Ferris wheel and a beautiful outdoor amphitheater with the city of Vancouver in the background. City of White Rock road ends? Would White Rock ever consider planting fruit trees along the inventory of road ends owned by the city that zig zag the White Rock hillsides? The trees would add to the barren moonscape on the hillside and never really grow high enough that they would block anyone's views. Over to you city hall. With an increased Asian population making the Semiahmoo Peninsula their home, we might think about celebrating Chinese New Year with our own Chinese Lantern Festival. In parts of Asia, the festival is typically celebrated on the fifteenth (last) day of the Chinese New Year period to mark the end of the holiday. The first annual lantern festival took place at Spanish Banks February 07. Over 7,000 spectators and lantern lighters turned up for the event. Lanterns were available for purchase for $5.00 at the event. White Rock this past year acknowledged our growing Asian community with a Chinese Moon Festival. A lantern festival could be a fun night and a great spectator event. The mass ascent would be a sight to see. Well this GOOD IDEA will continue to be a yearly event until someone up at White Rock City Hall buys into the cheapest most effective way for "our city by the sea" to get tens of thousands of free publicity yearly. 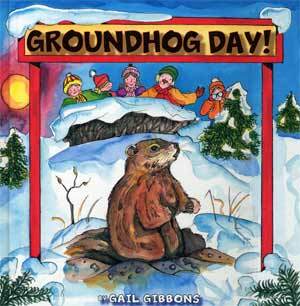 Quick name the cities in North America that get talked about every year when groundhog day (yesterday February 02) rolls around. So how about SEMIAHMOO SAM or WHITE ROCK WILMA or whatever you care to choose. Heck run a name the groundhog contest to engage the citizens. This is a no brainer. Just saying. 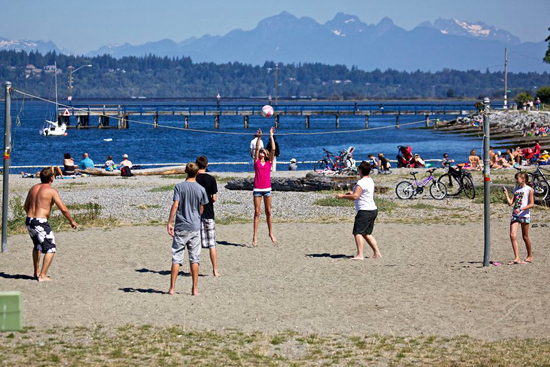 Could White Rock or Crescent Beach Play Host To A People Place? For the past few years the city of Vancouver have transformed the space on the south side of the art gallery along Robson street, into a gathering spot for shoppers and visitors alike. Over the years there have been a number of interesting transformations including a group of giant bean bag chairs that the homeless took to sleeping on at night. Ooops. So once again this year the city is putting up a $37,5000.00 grant up for grabs for the winning design. White Rock's grassy area by the pier and Crescent Beach's Blackie's Spit could benefit from just such a promotion. Don't you think? White Rock Says It Is An Arts Community? The street banners that festoon the White Rock waterfront and uptown areas are looking a little faded and weather worn. 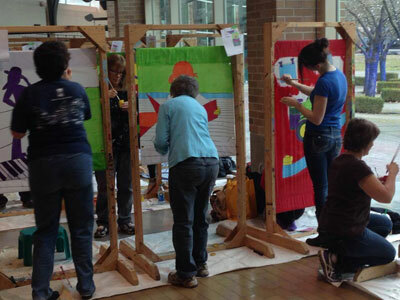 How about getting Semiahmoo Arts involved with a "show your pride" banner contest. Artists would pay a $25 entry fee to partake with the money going to a grand prize for the best banner as voted on by the public. 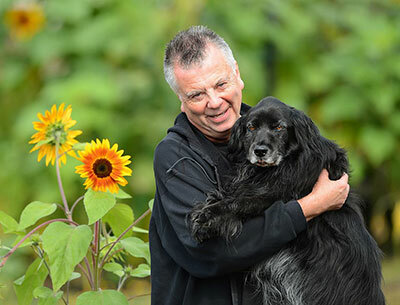 The city of Port Moody recently undertook just such a contest and the response was great. The banners are on display at the Port Moody Civic Centre until the end of the month before they are erected on the lamp standards around the city. 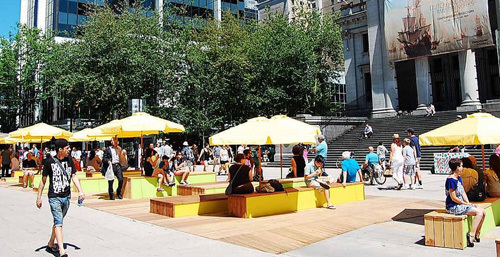 Push outs may be popping up around Vancouver this summer. What is a parklet? Good question. 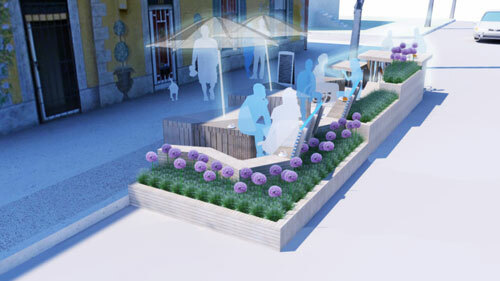 A parklet is the reclaiming of a couple of existing parking spaces and using that area to create a people place to enhance the experience of visiting a neighbourhood. I can see the how a couple of these located the 5 Corners and uptown district would really enhance the area. What say city hall? Central City's fourth "Big Rigs for Kids" Lighted Truck Parade illuminated the streets of Surrey over the holidays and were displayed in Holland Park. 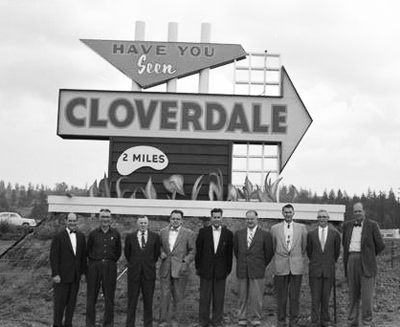 Consisting of over forty local and Vancouver Island Trucks, the convoy started at the Surrey Santa Parade in Cloverdale then travelled west to Whalley. So my GOOD IDEA is how about the convoy of beautifully lit trucks makes a detour and comes down 176 from Cloverdale, along White Rock's Marine Drive then back out to Whalley? 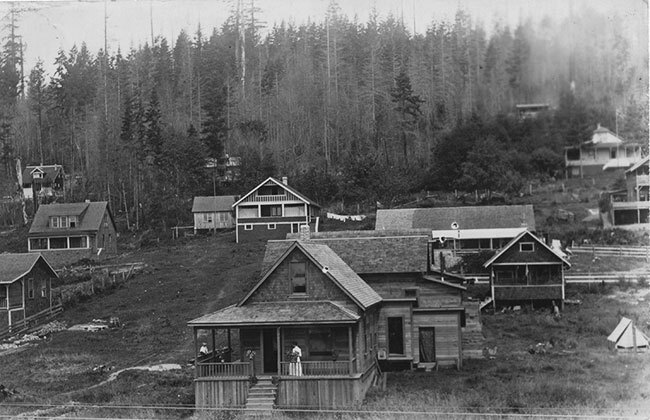 When this photo courtesy of the White Rock Museum surfaced recently, it got us to thinking. Why couldn't White Rock host an event similar to the Oyster Run just south of us in Anacortes, WA. The Oyster Run is loosely thought of by motorcycle enthusiasts as the last official ride of the summer before the time to put your bike away for the winter arrives. 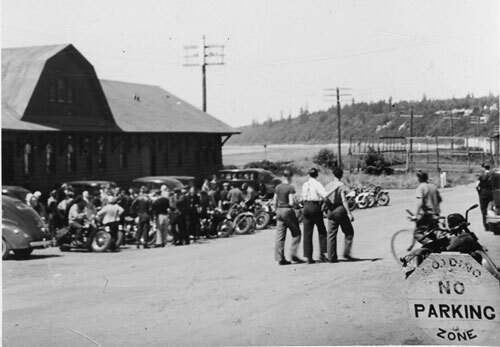 If you grew up in White Rock in the 50's & 60's the iron horse above will bring back a flood of memories. For a couple of decades this old iron horse, which used to be mounted on heavy duty springs was a fixture in Semiahmoo Park. It presently sits decaying near the abandoned tennis courts in Semiahmoo Park. So here's my idea. Let's restore it paint it all up really nice and put "Welcome To 5 Corners" and mount it on the grassy area outside of Laura's Coffee Corner. When the city of Vancouver painted the crosswalks along Davie street during Pride Week, it got us to thinking of how we could brighten up our town, get people talking and get White Rock thousands of dollars of much needed publicity. With International Artist Day coming up this could be a perfect tie in to publicize the event. This one is a no brainer. 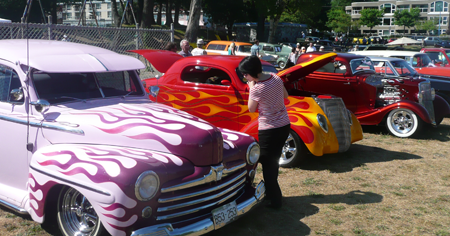 This past Sunday over 400 customs and hot rods filled up Semiahmoo Park. Great for the Elks food services, and the Semiahmoo parking brigade, but nada for the merchants of White Rock. How about closing off the parking lots on East Beach and filling them up with hundreds of hot rods and customs? Langley in September hosts the Langley Cruise In which is the largest in Canada, New West has a very successful car show as does Tsawwassen as well and Crescent Beach which host a bevy of beautiful cars later this month. I am sure the local car club Westcoasters would take care of everything. One phone call city hall, one phone call to the Rod God!. The city of Mission has come up with what we think qualifies as a GOOD IDEA. Hey White Rock City Hall, what do you think? The 2014 Budget process is now underway and we’re seeking your input on how the District will fund the quality of life in our community. From policing to public works, the District of Mission provides a wide range of programs and services to the citizens and businesses of Mission. For 2014, Council is trying to achieve no increase in taxes (a 0% target). Meeting this budget target is a challenge. We need your feedback to determine which services should be maintained or reduced in order to hold the line on taxes. Learn more about how the budget works through Budget 101, fill out the online survey, email us with your comments or stay connected through Twitter. We want to hear what you think. It’s Your Business! The City of White Rock next year has big plans to re-do the section of Johnston Road between 16th Avenue and Thrift Avenue. The present group of trees along the corridor have uprooted the sidewalks making it difficult and unsafe for pedestrians to navigate the sidewalks along the uptown section of town. Our GOOD IDEA would be to install palm trees along the corridor. Nothing says "Welcome To The Beach" like palm trees. Tsawwassen a few years back installed a centre median with palm trees. The trees were donated by forme Premier BILL VANDERZALM. When VANDERZALM read the story in the White Rock Sun of our good idea he offered to work out a deal to help White Rock install a similar corridor of trees, at a very affordable price. 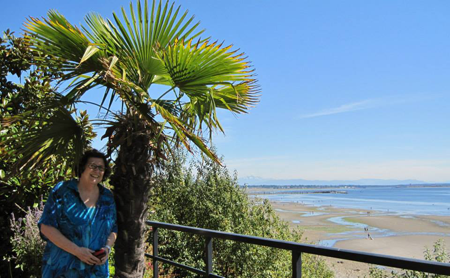 As you drive along the waterfront in White Rock along Marine Drive you will notice a number of homes already have installed palm trees and they are flourishing in "Our City By The Sea." We have submitted the idea to the city of White Rock. 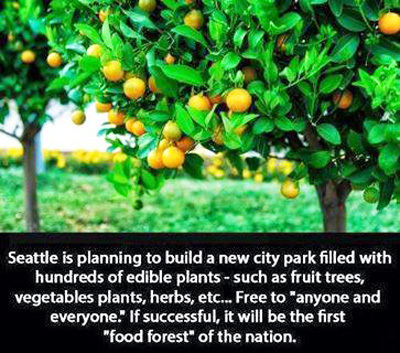 Here';s hoping the city adopts this GOOD IDEA. Why can't White rock install some summertime permanent beach volleyball nets. A pair could be put by the pier so strollers along the pier can stop and watch the game and cheer on the participants. Then a couple of nets could also be installed on East Beach. Everyone up at city hall keeps saying we need something to revive East Beach. Well, here it is. The nets would stay up all summer, anyone wanting to use them would simply bring their own volleyball. 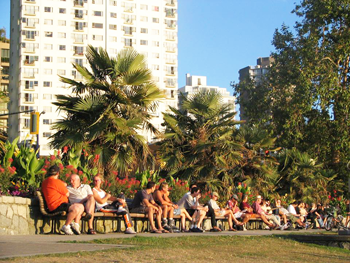 Have you ever seen the crowds that turn up every night out at Jericho Beach in Vancouver to play volleyball? It would be great for the waterfront businesses as the players need liquids to stay hydrated. Let's stop talking and let's get rocking! A few years back when White Rock was hit with a boil water advisory, it became patently clear there was no system in place to alert residents of an emergency. 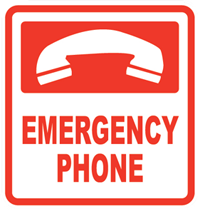 With the recent rail accident in Quebec we thinnk it is time for the city of White Rock to install an opt in phone system whereby residents can register their phone#. In the event of an emergency the push of one button and everyone in White Rock would be called instantly. Yes there is a cost factor. But really can't we afford not to install it? Many cities throughout British Columbia have the sysem in place. It is a no brainer the way we see it. In our continuing series of "Good Ideas" for White Rock/South Surrey we thank "Pitbull" PITCAIRN for this idea. On Hwy. 99 as you enter Canada from the US there is a large "Welcome to Surrey" sign on the 8th Ave. hillside, made with large concrete letters and lava rock background. Why not add "& White Rock" or "& White Rock Beach" below Surrey? The provincial government is responsible for this sign and would likely pay for the upgrade and if not, the $40,000 per year being spent for a nearby billboard would be better invested making this very permanent change. I was talking to Bill Vanderzalm about the Palm tree idea...He donated the Palms to Tswassen...have you seen them? He said we should change the street name to Palm drive, and market it as the northern most Palm Drive in North America... He said he could help out with the Palms. City Manager DAN BOTTRILL informed me the idea has enough credence that it has been forwarded to the committee designing the re-make of uptown next year. 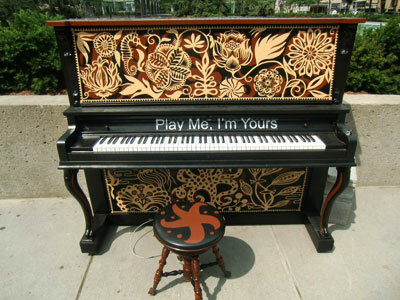 PLAY ME I'M YOURS - A month or so back when I started this series with the "Play Me I'm Yours" piano concept I was not aware Vancouver was launching the same program. I first encountered it a couple of years ago in Toronto and thought "Wow what a great idea for White Rock." I still think it is a great idea, I have a resident who is willing to offer up a piano, now we just need a location and some artists. This could happen very quickly. People will just walk up to it and sit down and start playing. Watch the crowd appear. CAR FREE DAY - It would be a wonderful idea to close off Marine Drive to all vehicular traffic for an entire day. We could put the tables and chairs out on the street and have a giant street party. 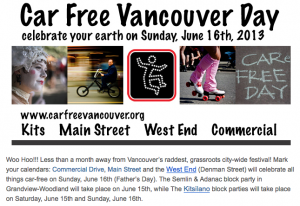 Every year this idea gets bigger and bigger with tens of thousands turning up in Kitsilano, Commercial Drive, Gastown and Yaletown. I actually understand the Spirit of the Sea Festival is considering something along this line this year in August. BRAVO. BRING BACK THE SANDCASTLES - Please, pretty please. I am on bended knees. 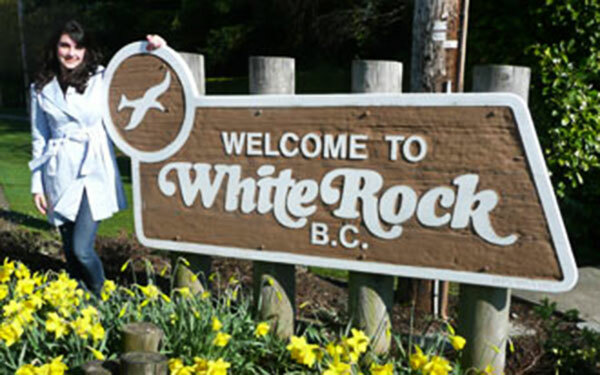 White Rock keeps trying to figure out how to "brand itself." Back in the 80's the one term mayor TOM KERSTEIN came up with the idea of a sandcastle competition on our beach. 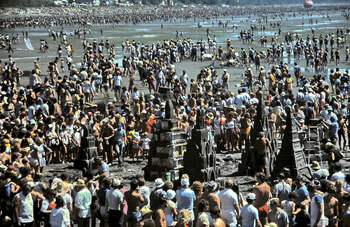 The event exploded, and within a couple of years we had 400,000 people on the beach. Its success killed it. Let's bring it back and keep it just big enough that we can control it and benefit from all the attention we get from hosting the event. Up until about a year ago we were listed on the internet as THE SANDCASTLE CAPITAL OF THE WORLD. some other city has not adopted it, but there is nothing stopping us from bringing it back. How about if the city of White Rock, White Rock Tourism and the White Rock Business Improvement Association comes together to create a "I Love White Rock" video contest. There could be dinner packages from local resaurants put up as prizes. Here are a couple of examples of what could be done.